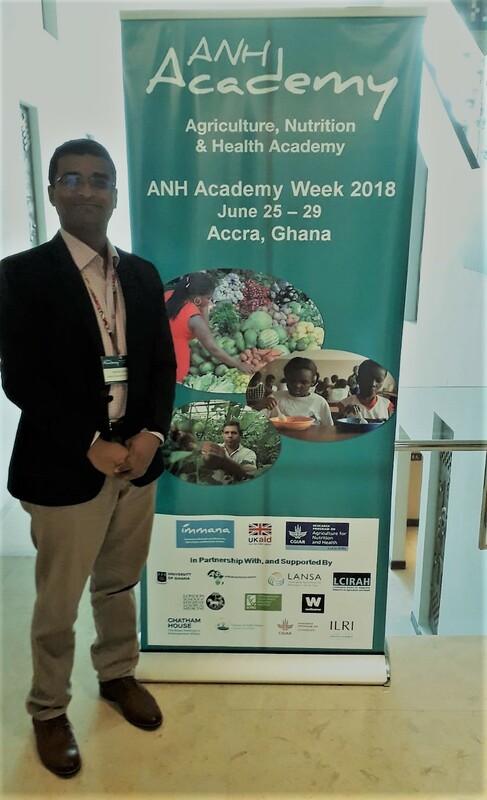 Abdullah-Al Mamun and David Little participated in the third Agriculture, Nutrition and Health Academy week which was held in Accra, Ghana from 25th to 29th June 2018. Dr Mamun presented results from our collaborations on "Impact of Different Agroecosystems on Household Food Consumption, Health Outcomes and Autonomy of Adolescent Girls in Seafood Farming Communities in Bangladesh." The Agriculture, Nutrition & Health (ANH) Academy is a global research network in agriculture and food systems for improved nutrition and health to serve as a platform for learning and sharing. The ANH Academy Week programme included Learning Labs (training workshops) offered by ANH Academy partners, a scientific Research Conference with invited papers, poster and panel sessions, and many opportunities for networking with other researchers and research-users.